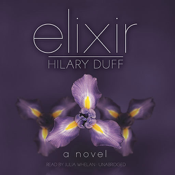 ELIXIR by Hilary Duff (unabridged) is presented by Blackstone Audio and comes with what is perhaps the best audiobook app available (see FEATURES, below). Clea Raymond has felt the glare of the spotlight her entire life. The daughter of a renowned surgeon and a prominent Washington, D.C., politician, she has grown to be a talented photojournalist who takes refuge in a career that allows her to travel to the most exotic parts of the world. But after Clea’s father disappears while on a humanitarian mission, Clea’s photos begin to feature eerie, shadowy images of a strange and beautiful man—a man she has never seen before. When fate brings Clea and this man together, she is stunned by the immediate and powerful connection she feels with him. As they grow closer, they are drawn deep into the mystery behind her father’s disappearance, and they discover the centuries-old truth behind their intense bond. Torn by a dangerous love triangle and haunted by a powerful secret that holds their fates, together they race against time to unravel their pasts in order to save their lives—and their futures. Self-contained, this audiobook app is perfect for your commute, on a trip, or while relaxing. Based on a library-quality recording, this app was built especially for your iPhone and iPod Touch. No unreadable text, no endless scrolling on a tiny screen. The audio is of higher-than-normal quality, making for a great listening experience that will not tire your ears or grate on your nerves. NOTICE: This app includes the exact same 5-star recording offered elsewhere at much higher prices. It was professionally recorded by Blackstone Audio’s narrator, Julia Whelan. You are not buying yet another amateur or volunteer narration. No clicks, background noises, throat clearing, mispronunciations, tinny voices or monotones will be found here. •EXPERIENCE. About 7 hours of narration. Created as a Folium enhancedAudio™ edition, this book includes extra functions and features not found on lesser players. •PLAYER CONTROLS. Includes listen (play), pause, multi-speed fast forward/reverse, jump ahead/back, chapter skip, volume control, one-touch chapter- and bookmark browser. There is also a “scrub” bar that finds any point inside the chapter with just a tap. •SLEEP TIMER. Have you ever fallen asleep watching TV or listening to a book? If so, you'll love this feature. Once set, the book will stop, place a bookmark, and allow you to jump back to where you probably began dozing. •CLEAR & ELEGANT DESIGN. Simple, clean, intuitive, and smarter than average. •CHAPTER TIMINGS. Always know how much time it will take to finish a chapter. Plus, the progress bar at the top of the screen shows how far into the book you’ve come. •OFFLINE LISTENING. You are airplane-ready! Once downloaded, listen uninterrupted without threat from a lost network connection. Downloads are usually just 5-10 minutes, but depend upon your network speed. •AUTO-BOOKMARKING. The player remembers where you stopped listening and returns to that exact spot when you open the book again. •TELL-A-FRIEND. An easy way to recommend the book to your friends or Twitter feed. •FEEDBACK. Share your ideas for books, functions, and features. We are very responsive to our listeners and appreciate all feedback and ideas. RATING: Suitable for teens who are fans of Hilary Duff.